My wife and I and our friends Don and Kris MacCubbin were staying at Monkey Mia and took an early morning hike on the Monkey Mia Nature Trail. The red sand dunes were criss-crossed with all sorts of interesting animal trails, from little ones probably made by beetles to great big ones probably made by goannas. While admiring a smallish, wiggly track in the sand, I happened to be notice a flash of silvery color. 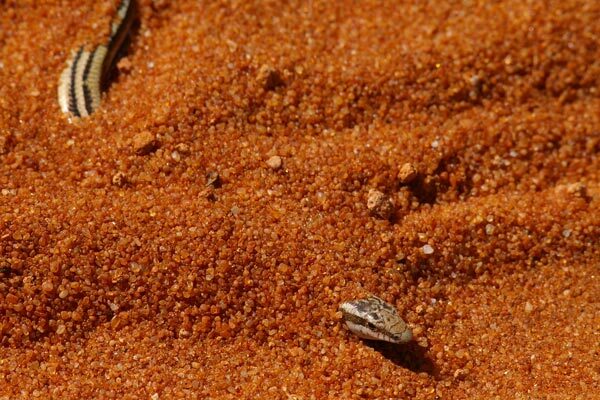 I realized that this was some small, speedy burrowing reptile and quickly pounced, scooping a big double-handful of sand below the head of the trail. 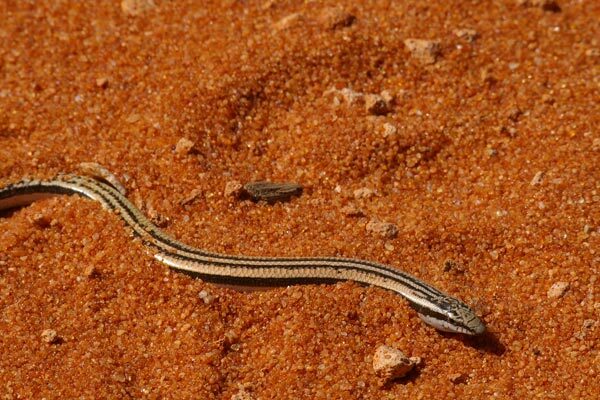 This little skink thrashed like mad back into the sand, and I rapidly scooped it out again. After playing this game a number of times, it finally calmed down (more likely, got tired out) enough to sit still in my hands for a few photos (this one was taken by my wife Monica). Then I put it into some very shallow sand to get the photographs in which the lizard is half-buried. When it came time to identify the species, I ran into trouble. 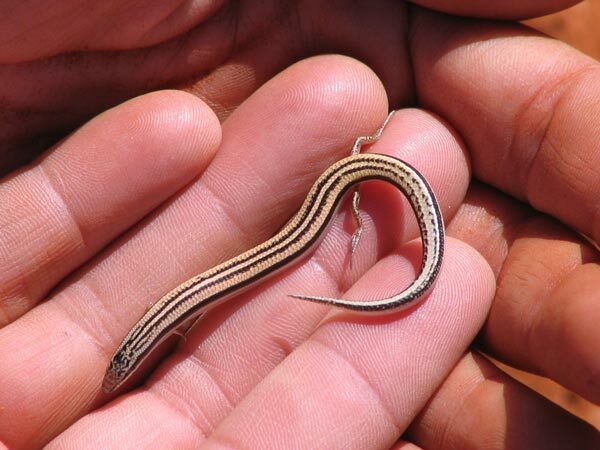 The skink is clearly some species in the genus Lerista, so I read up on all the possible candidates in that genus. The trouble was that none of the ones that lived in this area had a pattern very close to this one, and the ones that had any vaguely similar pattern had a mismatching leg or toe count. Unfortunately, I didn't realize the importance of the toe count, and the pictures are not completely clear about this. The skink I photographed has at least one toe on each front foot, but I have no photos that show conclusively that there is exactly one. And the skink I photographed has either two or three toes on each back foot; I'm reasonably certain it's three, but not completely certain. After reconsidering every Lerista species listed in Wilson & Swan and Cogger, the closest match seemed to be Lerista lineata. The pattern seems to be a perfect match (really the only Lerista species about which this can be said), and Lerista lineata has two toes on each front foot and three toes on each back foot. Herpetologist Steve Wilson (coathor of Wilson & Swan) concurred in email that this seemed like a reasonable identification given the available evidence. However, Lerista lineata is not known to occur on the Peron Peninsula. The closest known sightings are from Woodleigh Station, just east of the peninsula. This led me to believe that my sighting might be a significant range extension, and I wrote up an article for the Western Australia Naturalist journal about the sighting. However, the referees for the journal believed that the lizard is almost certainly Lerista planiventralis rather than Lerista lineata, and they certainly know far more about identifying Lerista than I do. So L. planiventralis it is.